Lawyer Checker report added to your case. Lawyer Checker is an online service developed to reduce uncertainty in identifying the legitimacy of the vendor conveyancer. The service allows you to gather information on the conveyancer to which you are sending money to and better assess the risk associated with the transaction. You will require a Lawyer Checker account to use this service and you will be billed directly by Lawyer Checker. When opening the milestone in your workflow with the Lawyer Checker action attached you will see the button available to perform the check. In order to perform a Lawyer Checker check you’ll first be required to enter your Lawyer Checker username and password and select login. You can choose to save your credentials for future use. To perform a check, enter the bank details and company details of the law firm in question and select next. The result will be displayed instantly in Hoowla and a Lawyer Checker report will be automatically downloaded and attached to your conveyancing case. You will also receive email confirmation that the check has been placed and that the report is ready to be viewed in Hoowla. In order to use Lawyer Checker in a conveyancing case, the ‘Lawyer Checker action’ will need to be added to the appropriate milestone in your workflow. We have setup our default purchase workflow to contain a Lawyer Checker check at the ‘Draft Contract’ stage. If you are using a custom workflow you have built specifically for your firm then adding the Lawyer Checker action to a milestone is very straight forward. Navigate to SETUP – WORKFLOWS, go to the relevant workflow and choose to edit the milestone that you wish Lawyer Checker to be attached to. 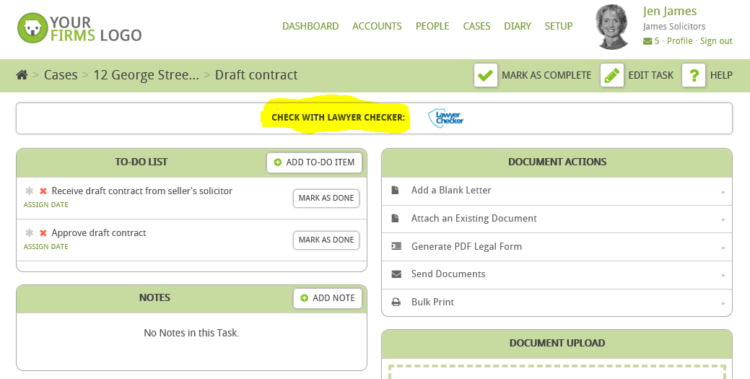 When in the milestone, navigate to Add a Pre-defined Action and select Lawyer Checker from the list. Selecting SAVE will add that action to your milestone in the workflow.